Under NEW: Whether you are designing the World’s Tallest Building or a 47 story office or residential tower, one can no longer ignore the looming threat of terrorism. Our team of experts will analyze your proposed drawings and determine how you can transform your award winning design into one of the safest & greenest skyscrapers on the face of the earth. Under EXISTING: In a time of economic crisis, where occupancy of existing and aging skyscrapers has become a growing concern due terrorism, retrofitting your skyscraper could make the difference as to whether your skyscraper is hemorrhaging with vacancy signs, or if it’s filled to capacity with tenants paying a premium for the added security of knowing they won’t meet the same fate as those who died on 9/11. Times have changed. No longer can the same protocols be applied to the skyscrapers that tower into the sky, especially after 9/11. Charging up the stairs to fight a fire can be an act of suicide. There has to be a better way. Thankfully there is. 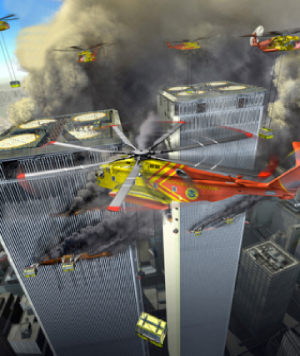 Skyscraper Defense will analyze the list of skyscrapers your department has to protect and devise a strategy that could prevent a particular skyscraper from becoming a towering inferno. It’s a known fact, that the two thousand people trapped above the impact zones in the World Trade Center towers during 9/11, perished because nobody was able to rescue them.